Much of why the debates around digital copyright remain so intractable is that our commonplace ideas about technology and its consequences are similarly polarized: either technologies change the world, or technologies are neutral. If the first is true, then the most radical predictions, utopian and nightmarish alike, can seem imperative enough to overwhelm more careful observation. If the second is true, then we can “stop worrying and love the bomb” overlooking the subtle ways in which the practices, policies, and expectations are changing around us. 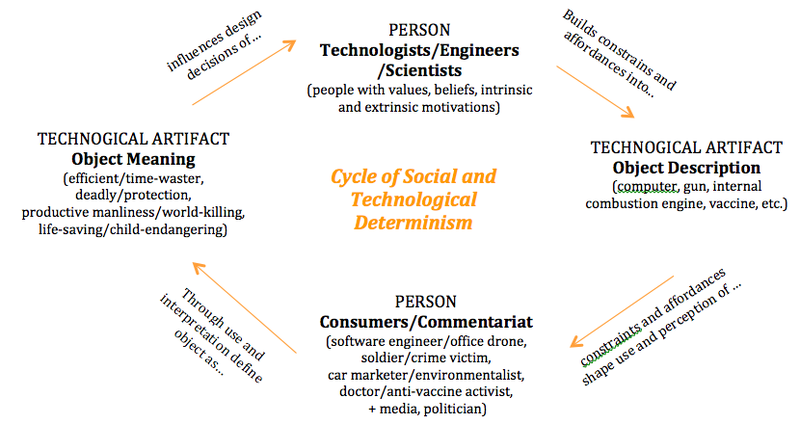 To fully investigate these disputes and their implications for digital culture requires more nuanced insights into the social embeddedness of technology, as well as an attention to how the political and social spaces from which technologies emerge shape their design and use. We must avoid the claim that the design of a technology wholly determines what is done with it, while also recognizing that the shape of a tool can have real, political consequence; we must recognize that technology is shaped by its designers and its users in material and symbolic ways, while not also assuming that it is infinitely malleable and therefor of little concern. Another wonderful and wise comment, Emily. You’ll notice that the site is changed, but it has not reached its final form. When it does I want your full feedback! At least now you can view posts on your phone more easily. “Jamaya’s” colleague referred you to her to do a training for her non-profit. She’s coming to your site to learn more about you to see if she’s interested in hiring you. She wants to understand what your expertise is, and more about your trainings. Can she find this content? How? “Akhil” is another activist scholar who came upon something you wrote 10 months ago. He wants to find a blog post you wrote so he can reference it in something he’s writing. Can he find it? How? “Tara” is a friend who periodically scans your blog to see if you’ve written anything new that catches her eye. Can she easily tell what content she’s seen before and what content is new? Some questions you may want to ask… Who are your core users? Who are you trying to reach? What do you want to be sure to this website communicates? What are the core use cases you want to be sure your new design addresses? This was all off the top of my head. Happy to talk offline as well. Btw, the experience on mobile is much improved! I actually now prefer it to desktop because it’s a simpler experience.